Installing a solar energy system represents an important financial decision for any individual or company. Business owners, corporate boards and individual property owners have a limited amount of financial resources. Therefore, they must compare the cost of a solar energy system to other projects, and allocate funds based on the best choice or highest priority. Another way of looking at the problem is to determine if putting the money in an investment that pays more in return compared to the energy cost the solar system would have provided. The outlay invested in a solar system has an “opportunity cost.” The opportunity cost refers to the diversion of funds away from capital project, or interest forgone on an investment. To facilitate decision-making, and determine the best option from a financial perspective, use the Internal Rate of Return (IRR) to help identify if a long-term investment in a solar energy system is a financially favorable investment. Investing in a solar energy generation plant creates dividends in the form of cash, no longer paid to the utility supplier. 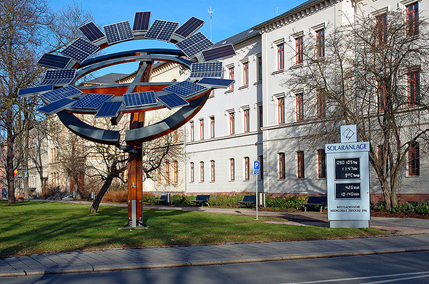 A solar energy system has an internal rate of return, with a yield, higher than most investments. Historically, electricity prices trend up due to inflation. The following chart shows the rate increase for California’s Pacific Gas and Electric Company (PG&E) for the past four decades. 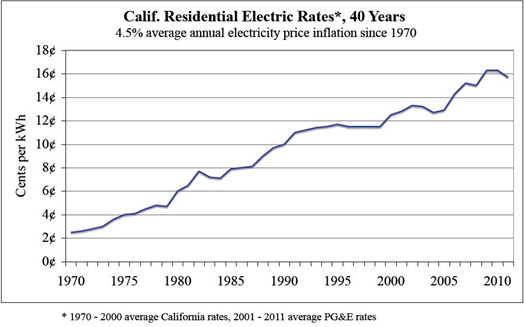 The annual electricity rate hikes for PG&E customers averaged 4.5 percent from 1970 to 2010. From about 1972 to 2010, the inflation increased at almost a six percent annual rate. Often, when factoring in the electricity price inflation, the cost of a solar energy system per kilowatt-hour (kWh) is lower. This phenomenon increases the value of a solar energy plant over time as the owner of the system saves money. The Net Present Value, of the difference between the photovoltaic system’s energy cost and price, determines the IRR. The IRR defines the amount of profit investors’ gain by investing in a solar energy system—as a percentage. For example, an IRR of 12% means the investor makes a profit of 12% per year on any funds invested in the project. However, investing in a PV system presents both risk and opportunity to the investor or owner because of the unknown future price of electricity. In addition, the secondary market can affect the risk and opportunity over the 25 to 30 year life expectancy of the solar energy plant. The IRR, also called the Discount Rate, sets future cash flow to zero. This helps to compare projects using the same metric. For most companies, when all other factors are even, the project selection may come down to the highest IRRs. However, in some cases, the highest internal rate of return may not determine the final decision. Calculating the IRR for the solar energy plant requires few basic variables, which analyze and compare the solar energy systems. The actual values depend on the scenario. Conventional electricity rates – Determines the price per kilowatt-hour (kWh) paid for electricity. Higher electricity prices charged by the utility company make the PV system more attractive. The primary value of a solar system comes from avoidance or reduction of electricity charges from the utility company. For example, both Company ABC and Company XYZ use 15,000 kWh of electricity a month. Company ABC pays an average of six cents per/kWh. Company XYZ spends 12 cents per/kWh. Each company installs similar photovoltaic systems, which reduces their usage of grid-generated electricity by 50 percent. Utility company’s rate increases – System owners and investors must account for inflation, which affects electricity rates, as it does other goods and services in the general economy. Part of the financial planning for many firm centers around the reduction of energy costs, in this case, exposure to rising electricity costs. To determine the financial viability of a solar energy system means factoring in future electricity rate inflation into the equation. The higher the assumed rate of inflation, the quicker the payback, and the higher the IRR on the money invested into the system. Solar system performance – Over the life of the solar system, 25 to 30 years, the performance of solar panels decline-- from one year to the next-- as the equipment ages. Therefore, the company must include the degradation of solar panels into any IRR calculation. Use a conservative figure such as 0.25 percent, annually, up to a maximum efficiency loss of 20 percent. System maintenance – Solar system are naturally rugged and low maintenance. 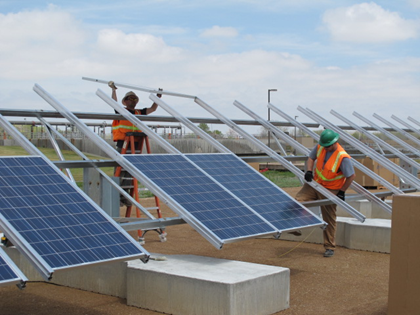 Nonetheless, the panels require periodic maintenance. Unless the system has tracking equipment to follow the sun, it has virtually zero moving components. Most IRR calculations include a multiple of 0.2 percent for the maintenance required to keep the system dust and dirt free. In addition, the solar energy plant requires replacement of the inverter in Year 15. Government incentives – Government incentives and subsidies have played a key role in helping PV systems achieve cost-effectiveness as compared to fossil fuels. These enticements include tax rebates, grants and tax credit. Incentives lower the upfront costs and significantly increase the IRR. Other variables an include an individual’s income tax rate, and the "Tax Equivalent Rate,” which any investment after tax returns in lieu of a solar system that is not taxed on utility charge savings. Some other factors to consider are taxes, electricity savings in year one, remaining utility electric bill per month and environmental benefits (carbon emissions) and expected lifecycle payback for the system over 25 years. The percentage of lifecycle payback over 25 years, consist of the lifecycle savings of the solar systems. For example, if the savings total $107,284, divide it by the cost of the PV system ($107,284/ $40,000) x 100 = 288 percent lifecycle savings, over 25 years. The formula for the internal rate of return for a PV system includes the following components/definitions: PV system cost, First cost subsidies, PV energy cost and Secondary Market Characteristics and PV energy price. PV system cost (PVsys) equals the installed cost of the photovoltaic system. First Cost subsidies (PVfcs) refer to financial incentives issued from governmental entities and applied in year zero, which reduces the system’s upfront costs. PV energy cost (EPVc) entails the PV system’s installed cost minus the value of First Cost Subsidies, plus the net present value of maintenance and repairs, over the life of the PV system. This equals the total cost of the energy generated by the PV system. Secondary Market Characteristics (SMC) includes public policy incentives, such as carbon credits, feed-in-tariffs, or renewable energy certificates. These items capture and trade non-energy attributes of the photovoltaic system. PV Energy price (EPVp) represents the net present value of the “time integrated market price.” This is the total price of all the energy generated by the solar energy system. Calculate the IRR of the solar system. Again, define IRR as the cost of the electricity produced by the solar energy system, including future maintenance cost brought back to the present. Set this part of the equation equal to the net present valve of the price of the electricity, purchased from the utility company, absent a solar energy plant. Inflation in the electricity market, over the production of the solar energy system, increases the IRR of a solar energy plant. Subsidies or grants received from the secondary market enhance the internal rate of return. The IRR links the present value oaf a photovoltaic system cost with the electricity or heat generated over the life of the solar energy system. It gives the owner a of he financial behavior of the over the life cycle of the PV system. IRR also provides the information organizations and individuals require for comparing a photovoltaic system with another investment, to analyze the project and manage financial risks and opportunities.